The next generation of printing is here. Print professional-quality color-up to twice the speed and half the cost per page of color lasers,-using HP PageWide Technology. Help workgroups thrive with proactive manageability tools. Print at record speeds with the world's fastest desktop printer. Tap and swipe the 4.3-inch color touchscreen to quickly print and access time-saving business apps. Depend on HP for reliable workgroup printing-designed for high volumes up to 4,200 pages a month. Print wirelessly, and share access with PCs, tablets, and mobile devices-even with no network or router. Walk up and print right away, using the easy-access USB port. Print files directly from your thumb drive. Conserve resources without sacrificing performance. Keep costs in line. This ENERGY STAR qualified device uses up to 50% less energy than color lasers. Mobile Printing Capability Footnote: HP ePrint requires an Internet connection to the printer and an Account Registration with HP Web Services. Print times may vary. For a list of supported documents and image types for HP ePrint, see hp.com/go/eprintcenter. AirPrint and the AirPrint Logo are trademarks of Apple Inc., registered in the U.S. and other countries. AirPrint requires the printer be connected to the same network as your Apple device. Wireless performance is dependent upon physical environment and distance from the access point. 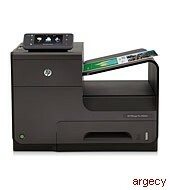 For additional solutions, see hp.com/go/mobile-printing-solutions. Comparison based on manufacturers' published specifications of fastest available color mode (as of March 2012) and includes color laser MFPs < $1,000 USD and color laser printers < $800 USD as of March 2012, based on market share as reported by IDC as of Q1 2012 and HP internal testing of printer in fastest available color mode (sample 4-page category documents tested from ISO 24734). Cost per page (CPP) claim is based on the majority of color laser MFPs < $1000 USD and color laser printers < $800 USD as of March 2012, based on market share as reported by IDC as of Q1 2012. ISO yield is based on continuous printing in default mode. CPP comparisons for laser supplies are based on published specifications of the manufacturers- highest-capacity cartridges. CPP based on HP 970XL/971XL ink cartridges' estimated street price. Based on published fastest print speeds for the HP X551dw and X576dw models compared to laser and inkjet color desktop MFPs < $1000 USD and printers < $800 USD validated by WirthConsulting.org Jan. 2013Capacity up to 1,050 sheets with optional 1x500 sheet accessory paper tray not included; please purchase separately. Requires an Internet connection to an HP web-enabled printer and HP ePrint account registration (for a list of eligible printers, supported documents and image types, and other HP ePrint details, see hpconnected.com). Mobile devices require Internet connection and email capability. May require wireless access point. Separately purchased data plans or usage fees may apply. Print times and connection speeds may vary. An app or driver may be required to use HP wireless direct, for more info go to hpconnected.com. Wireless performance is dependent upon physical environment and distance from access point. Majority of color laser printers < $800 USD and color laser MFPs < $1000 as of August 2012. Energy use based on HP and HP commissioned third-party testing. Actual cost and energy usage may vary. Program availability varies. Original HP cartridge return and recycling is currently available in 47 countries, territories, and regions in Asia, Europe, and North and South America through the HP Planet Partners program. Sending digital files requires network or Internet access wireless access point and an Internet connection to the printer. Services require registration. App availability varies by country, language, and agreements, and requires a firmware upgrade. Page volume based on HP 970XL black ink cartridge. Compares weight of empty cartridge and packaging materials needed for 15,000 pages using highest-capacity cartridges of major in-class competitors' color laser MFPs < $1000 USD and color laser printers < $800 USD as of October 2012. Tested by Buyers Lab Inc.